Twelve and a half years ago, when electronic calendars and computer systems that relied on them changed years from ’99 to ’00, all hell was supposed to break loose. Power grids would come to a grinding halt. FM radio transmissions would cease. Cell-phones would automatically update with rotary dial apps. Women would cover their heads with ridiculous-looking hats while perfectly able-bodied men would walk with canes. 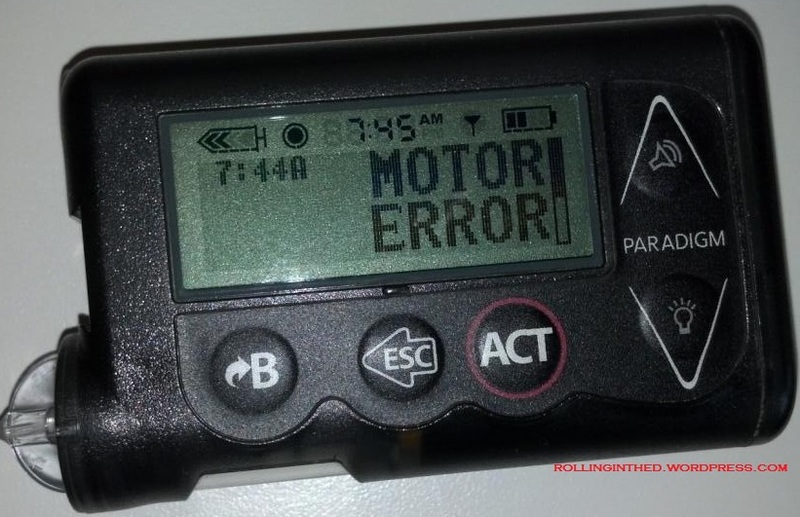 Insulin pumps would all experience Motor Errors. Well, nobody predicted that last one in 2000, but for some reason, it seems to be happening in 2012. Wil’s tribulations have been well documented. Scott K. Johnson’s pump reported its second Motor Error less than a month after its first. You see where I’m going with this. (If you don’t, you haven’t seen my Twitter feed or the new image at the top of this post). Just after delivering my breakfast bolus, it happened to me. Again. Seriously, there’s something going on with all of these Motor Errors. It’s like someone snuck a computer virus in the 100,000 lines of code that powers insulin pumps, and the virus is just now becoming active, in 2012. Maybe I should set my pump-clock back a few years and life will be good again. This seems to be more than a coincidence, it’s starting to become a pattern, and it’s a little bit concerning. (Granted, Scott and I have only had the problem on one pump – each, but still…) I have a feeling that there are some other Medtronic pumpers out there experiencing the same thing. If you are one of them, please speak up! Now, let me make one thing clear before I go on, particularly to anyone who is trying to decide what type of pump to use. I LOVE MEDTRONIC PUMPS, AND I LOVE THEIR CUSTOMER SERVICE. I’m not about to even consider switching. In fact, the woman I spoke with when I called was so nice to talk to, I’m thinking of calling back to invite her over for Thanksgiving dinner. A short lesson on Motor Errors that I learned today: every time the pump delivers insulin, that little gray piston inside the pump pushes the reservoir plunger, ultimately pushing insulin out of the other end of the reservoir and through the tubing. Before and after (and during) delivery, the pump checks the position of the piston to see that it is where it should be. So if the pump thinks I’ve got 67.8 units left in the reservoir, that piston better damn well be at that 67.8 unit mark. If it’s not – if it’s at 67.7 or 67.9 – that causes a Motor Error and the whole thing shuts down. Conversely, if it’s trying to deliver insulin – trying to move from 67.8 to 67.7 – and the plunger won’t budge, then you get a No Delivery message. Maybe that zero-G centrifugal force action that happens at amusement parks is why they’ve recently cautioned against wearing pumps on roller coasters. I’m not sure – it sounds sketchy to me. Anyway, as I went through all of the steps that the Medtronic reps take you through, including putting an empty reservoir (filled with air, and tubing of course) in the pump and trying to prime it, I heard a bit of a “stutter” as the motor pushed the plunger through the entire length of the reservoir. I heard keystrokes clattering in the background as I relayed this message to my friendly rep over the phone. Surely, they’ll check that out when this pump is returned to them – soon after its replacement arrives at my house tomorrow. Posted on July 5, 2012, in Diabetes, Insulin pump, Personal and tagged motor error. Bookmark the permalink. 7 Comments. Yup, there is definitely something going on with all these motor errors. I got one a month or so ago on my new (only about a month old) pump!!! Like you said, customer service is great and they ran through all of the tests with me and it’s been fine since. But it’s a little bit scary. I actually told one of the Medtronic employees all about it when I was at FFL – they definitely need to be (and want to be) aware of this! !